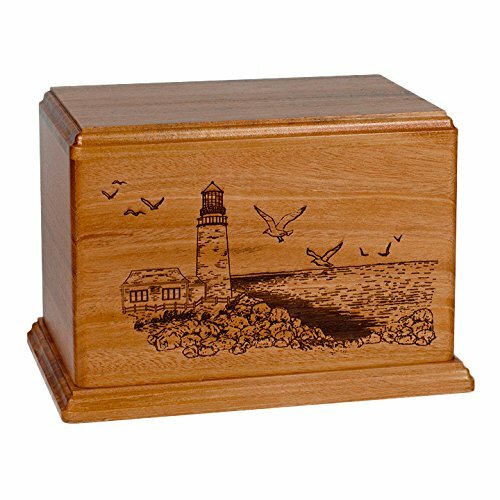 This urn is made from the finest solid hardwoods with a laser etched scene carved into the front. This solid cherry urn shows a beautiful lighthouse scene carved into the front panel. Made in the USA: Each urn is individually hand crafted by a skilled wood crafter in the United States. Availability: » Each urn is custom made for the client upon ordering and typically takes 1-3 business days to ship; however, it can take as long as 5 business days depending on the workload. » If this is needed for an event, please contact us with the event date so we can be sure it will arrive in time. If you have any questions about this product by Memorials Forever, contact us by completing and submitting the form below. If you are looking for a specif part number, please include it with your message.